BayArena, initially called Ulrich-Haberland-Stadion, was built in the mid 1950s to replace Bayer’s previous home Bayer Sportplatz. Ulrich-Haberland-Stadion officially opened on the 2nd of August 1958. It was oval-shaped, had one covered main stand, and could hold about 20,000 visitors. When Bayer promoted to the Bundesliga in 1979, a new temporary East Stand was built, though more significant improvements were needed to successfully compete at the highest level. In 1986, the club therefore embarked on a major redevelopment program. Works started with the reconstruction of a new West Stand, continued with the East Stand, and were then completed with both ends, enclosing the entire stadium. Works were completed in 1997, and resulted in a capacity of 22,500 seats, all covered. One year later the stadium’s name got changed to BayArena. 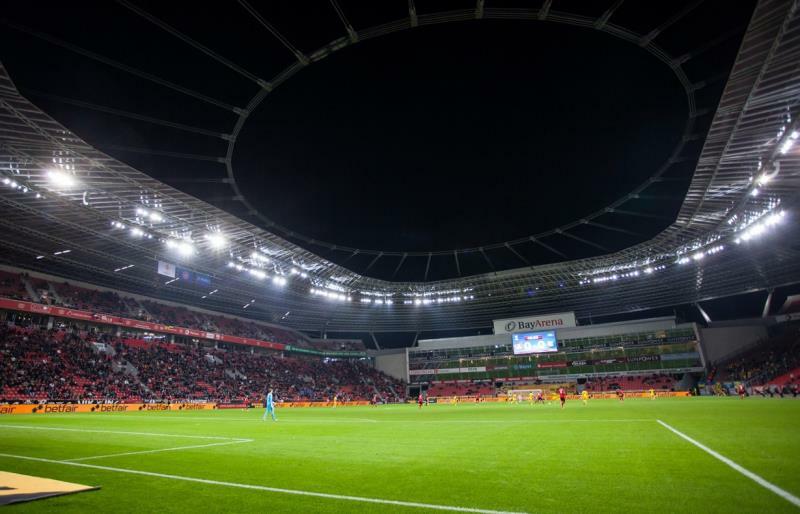 The new BayArena, however, soon turned out to be too small for the increasing fanbase of the club, and as a result a €70-million expansion project was announced. Building works began in 2007, and included the addition of a small extra tier, the conversion of part of the seats into standing places, and the construction of a new roof. The roof supports itself from the outside of the stadium, which means that future capacity increases will be relatively easy. The BayArena is located in central Leverkusen where the A1 and A3 motorways intersect. Even though the stadium lies adjacent to the A1, it does not have its own exit. The stadium is therefore best reached from the A3. Take exit 24 Leverkusen, turn east onto the Willy Brandt Ring, turn left onto the Kalkstraße, turn left again onto the Gustav-Heinemann-Straße, and, after passing underneath the A3, right onto the Bismarckstraße. Alternatively, take exit 22 Leverkusen-Opladen, turn right onto the Bonner Straße, direct right again onto the Europaring, and, after passing underneath the A3, left onto the Bismarckstraße. Continue for about a kilometre and, after having gone underneath the A1, you will reach the stadium. The BayArena lies at about 10 minutes walking (crossing the park) from overground metro (S-Bahn) stop Leverkusen Mitte. Leverkusen Mitte is served by line 6, which runs between Cologne and Düsseldorf. From both cities the journey is about half an hour. One can also take a train from Cologne’s main railway station and get off at Leverkusen Schlebusch station (15-minute ride). From there it is a 15-minute walk to the stadium. The BayArena is located in a predominantly residential neighbourhood with little around, though Leverkusen’s city centre is only a 15-minute walk away. While Leverkusen does not rank among Germany’s most attractive cities, it does have a few eating and drinking options. If you wish to stay close to the BayArena, then Lindner Hotel Bayarena will serve you perfectly as it is located inside the stadium building. Other neaby choices are BestWestern Hotel Leverkusen and Hotel Brauhaus Manforter Hof and there is an Ibis Hotel in Leverkusen’s centre, which is slightly cheaper. 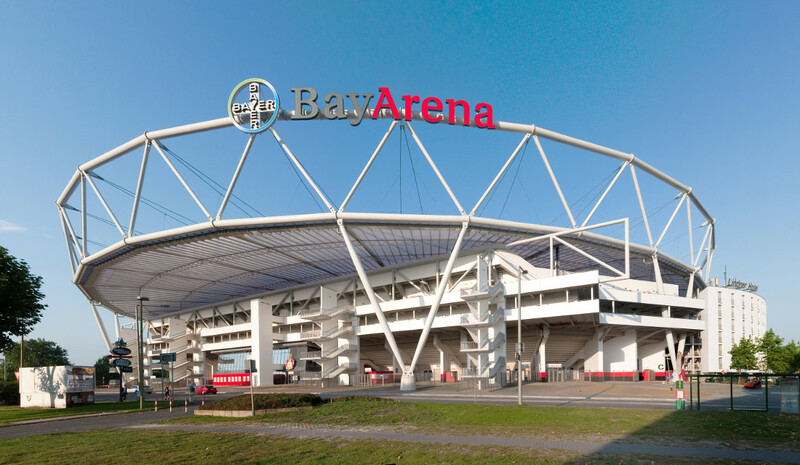 Click here for an overview of hotels near the BayArena. If you have a little more time on your hands, you can also consider staying in Cologne or Düsseldorf, much more interesting cities, and take the S-Bahn to the stadium for the match. Tickets for Bayer 04 Leverkusen games can be bought online, by phone +49 (0) 1805 040404, or in person at one of the Bayer 04 shops. One of these shops is located at the BayArena and the other at the Wiesdorfer Platz 9 in Leverkusen’s centre. Bayer 04 do sell out the occasional home game, but for most games tickets will be easily available in advance. Bayer have divided their home matches into three pricing categories. Ticket prices for category C games, the cheapest, range in price from €17.00 for an upper-tier seat behind the goal to €32.00 for a central seat at the main stand. Standing costs €15.00. Tickets for category A games, the most expensive, range in price from €32.00 to €68.00. Standing remains the same price at €15.00. Email info@bayer04.de for more information. Bayer 04 offer guided stadium tours that include visits to the dressing rooms, players’ tunnel, press room, dugouts, and VIP areas. Tours run from a few times to a dozen times each month depending on the season, usually in the afternoon. Dates are announced on the BayArena website. There are special tours on matchdays. Bookings are required and can be made by phone +49 (0) 1805 040404 or email info@bayer04.de. The tour costs €10.00. Bayer04.de – Official website of Bayer 04 Leverkusen. Leverkusen.de – Official website of the city of Leverkusen. VRR.de – Information on public transport in the Rhein-Ruhr area. Bahn.de – Check train times and fare information. I went to watch Bayer against Bayern Munich last Saturday. I bought the ticket about 3 months in advance. Unfortunately I had to buy a bundle of 3 tickets(one from each category to by able to attend Bayern game). It was still cheaper than buying outside the stadium. Having watched Fortuna dusseldorf earlier the same day I got on a train to Cologne and got off at Leverkusen Mitte station. You can see the stadium from the station. Just cross the park to reach Bay Arena. The game itself was a bit disappointing. Bayern fans were everywhere even in the home stands. They did not have to hide the scarves and shirts. Atmosphere was awesome. Both sets of fans sang for the entire game. They were free match programmes to pick up around the stadium. Afterwards I got on the same train but this time to Cologne. Very nice and modern stadium. Friendly fans. You can not use cash inside the ground. Only cards are accepted(you need to get one card and load it with cash). You can return this card after the game to get your money back. Stadium with Arsenal, when we drew 1-1, it was the year that you got to the final in Glasgow and were beaten by Real Madrid. Just recently i only saw your improved stadium and im sad that your old ground structure has gone, i loved the fact that your old floodlights were outside the ground on huge poles leaning in and above the away supporters heads in the ground were ceiling heaters, like the old electric coiled bars you used to see in household electric bar fires.